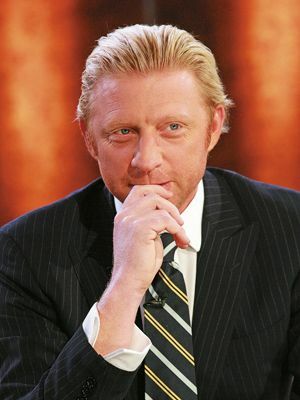 Boris Becker is a former World Number One professional tennis player. In 1985, he was the first German, and the youngest man, at 17, to win a Wimbledon championship. His record remains unbroken. He is a six-time Grand Slam singles champion and won another 49 singles titles over 14 years. They include two more Wimbledons, two Australian Open titles, a US Open, and an Olympic gold medal in the men’s doubles competition. Becker began building a successful business during his championship years. He has a sports marketing company in Switzerland that bears the intellectual property rights to his name and handles his sponsorship deals. There are Boris Becker tennis racquets, tennis bags and accessories, and a Boris Becker men’s fragrance. He owns a real estate company, and has three Mercedes Benz dealerships through Autohaus Boris Becker GMBH & Co KG. He is an ambassador for Mercedes Benz and Visit Britain. Forbes India met with Becker at his private office in London. Growing up, what separated you from your peers; is it inherited or can it be taught? My strong desire was always to give my best, to win. I was not satisfied with second place. It is part of my DNA; it’s not something you can teach. It comes from within. I was successful quite young. You have to love what you are doing, or you won’t do it so often or so well! The motivation and inspiration had to be so much higher because when you’re the best at 17 or 18, where do you go next? You need determination to survive and have a successful career. It’s not something my parents or my sister or my mentor gave me. I’m grateful to my parents for giving me wonderful possibilities for the first 10-15 years of my life, but you make the difference by using the possibilities given to you the right way. Many kids from wealthy backgrounds are in the clubs until 4 am. I wasn’t one of them. Very few people are successful at 17. How did you start your second career in business? Sport is unique in that you retire at an early age, while you’re still young and not experienced. Most sports champions don’t do too much after that. When I retired from professional tennis in 1999, I felt it was important to take a break and take a good look at myself. I was too mentally involved with tennis. I thought I was still good enough to play the game. I wanted to try new things—and possibly fail at a few! How would you compare an entrepreneur facing a challenge and a tennis player being a set down? Nothing comes easy. It’s rare for a business to grow quickly or to hit a ball straight down the line. Most business deals and big tournament wins come through heartache and difficult moments that you have to overcome. You shouldn’t lose the focus of why you started in the first place. Unfortunately, most people, in tennis and in business—they give up at the first hurdle. That’s why you don’t have so many successful people. A very few find a way to overcome the problem, find a solution. That’s where you make a difference. How did you structure your tennis and business development? I’m a team player and a family man. Throughout my life, I’ve had very good mentors and very good people around me. They were all 25-30 years older than me. They helped me to get to where I wanted to go. My father, Karl-Heinz, was my first mentor. My first tennis mentor was the Romanian, Ion Tiriac. I was 15 when I met him. I was with him for 10 years. He started as a tennis manager. I opened up Germany for him. My third mentor was the late Dr Axel Meyer-Wölden. After my retirement, I moved to Switzerland and surrounded myself with experienced, usually older men who may not have known much about tennis; but they knew a lot more than I did about business. One of my most important business mentors was Dr Hans-Dieter Cleven. He was the CFO of the Metro group, a Germany-based department store chain. With him, I started Völkl Tennis—part of the Völkl Ski company. He approached me about going in for this joint venture. How did you build the Becker brand? It started because I managed to do a few things in tennis that nobody had done before. By the time I turned 26, 27, I understood what brands were. I felt that in sport, I was able to become a brand. Playing for so many years in front of millions of people, they have a certain expectation when they meet Boris Becker. That quickly becomes a reality. If you’re smart and surround yourself with the right people, you quickly become a brand. What does the Becker brand stand for? I’d like to think it stands for sport, breaking records, being very multicultural, very international, nothing is impossible. How did you go about the transition from being a sports champion to being a businessman? In order to become the very best in your chosen profession, you have to work a little bit more. We have a terminology in sport; you have to go where it’s painful, where it hurts. The difference between winning and losing a Wimbledon match is not so much at the beginning, or in the second set, it’s usually when you have to go over your own limit. That may be in practice, that may be in quarter finals. There’s always a moment when you can’t go on any longer, and then your instincts take over. You need to succeed. You have to jump over your own shadow. That was important in my tennis career and is important in my business too. The bigger the challenge, the better I get. What skills have you transferred from sport to business? The reason you get into a business conversation is because you want to make a good deal. There were many tennis tournaments and matches I didn’t want to play. But I knew that the reason I went to—I don’t know where—to play, was to win the match. So I transferred that mindset and motivation to my business life today. If I didn’t have it, I might as well stay home. What’s the biggest lesson you’ve learnt in business? You can’t do it on your own. I’ve mentioned four mentors. You have to surround yourself with people who are maybe just a little better than you are at what you do. You learn from them. Yes men are sometimes easier, more fun. But it’s not productive to be with them. A code of conduct is very important. The older you get, the smaller the world you move in becomes. Your morals have to be right. If you’re not honest, they eventually catch you. I try to stay with countries where I understand the language and the culture. So my main investments have been in Germany and England; and though I don’t understand the language, I have an investment in Spain as well. What would you say to an entrepreneur who is in a no-win situation? There’s a poker saying: “No shame in folding.” There’s no shame in saying stop, or losing a business deal—because you cannot make them all. Sometimes it isn’t actually your fault. Sometimes you’ve just got to throw your hand away. I have a good setup in London. I’m proud of my Becker private office and I have a sports marketing agency in Switzerland. I have other businesses in Germany. Now, I have to follow through, develop and continue the journey. As a businessman, how do you cope with negativity and criticism? The more successful you are, the more you are criticised. Life gets very thin once you grow. Your family and your close friends are important. They tell you honestly whether today, last week, or last month was terrible because they mean it; they say it out of love and respect. Newspapers and magazines don’t care; whatever story they can create about you is to sell more newspapers. It doesn’t mean it’s true. A successful tennis player plays the right percentage at the right times. The same metaphor can be used for business. If you have success with a certain way of dealing, you continue until the percentage goes down—then you change. What kind of business people would you like your sons and daughter to be when they grow up? They should be independent, civilised human beings. They have to find out what’s right and wrong. I want them to understand the value of money, that everything has a price. If you make your own money, you become more independent.